…one to go. 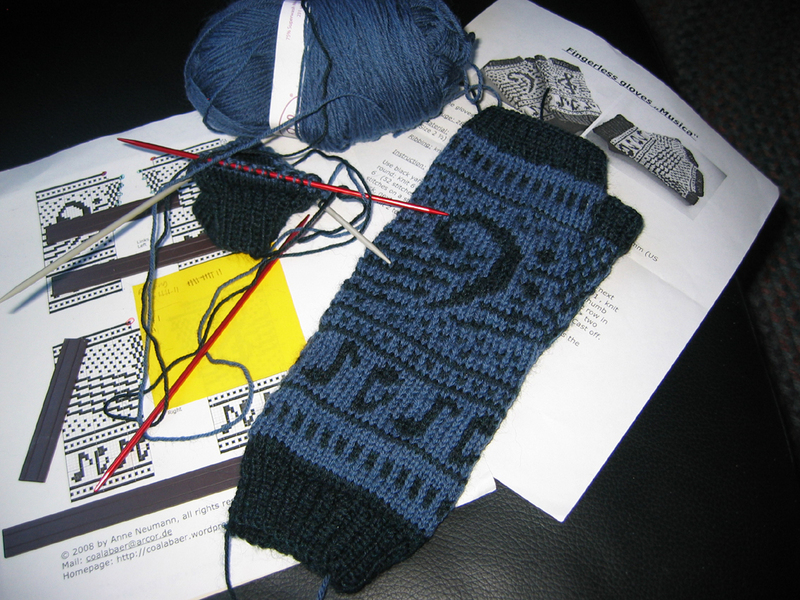 I finished the left Musica mitt last night and started the right one. Since both have different patterns, I think the next one will be as quick and the first. No boring knitting. The yarn color is very close to the border on this page, kind of a dusky blue. The photo is much brighter. We started our Christmas decorating around the house and Mr. Aitch wants to put the lights up outside this afternoon while it’s sunny and above freezing. I have some more FO’s to show you later this week. This entry was posted in knitting, mittens and tagged Christmas, knitting, mittens by Patti_is_knittinginflashes. Bookmark the permalink. Good picture! Do you have a pattern for the design or did you make it up with the musical notes? Tell Mr Aitch that it is not warm up north although the temp should reach around 50+ by Tuesday. I found some more of my music ed books from my Glenville days. Brought back some music memories.